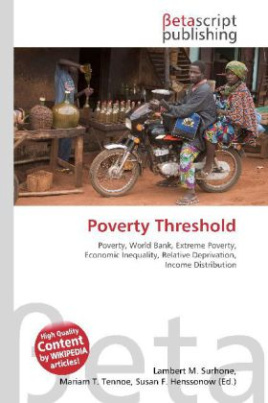 Please note that the content of this book primarily consists of articles available from Wikipedia or other free sources online.The poverty threshold, or poverty line, is the minimum level of income deemed necessary to achieve an adequate standard of living in a given country. In practice, like the definition of poverty, the official or common understanding of the poverty line is significantly higher in developed countries than in developing countries. The common international poverty line has been roughly $1 a day, or more precisely $1.08 at 1993 purchasing-power parity. World Bank has done extensive work in this field. Determining the poverty line is usually done by finding the total cost of all the essential resources that an average human adult consumes in one year. This approach is needs-based in that an assessment is made of the minimum expenditure needed to maintain a tolerable life. This was the original basis of the poverty line in the United States, whose calculation was simplified to be based solely on the cost of food and is updated each year.